Last summer, Mr. Fresh released his debut EP Halcyon Sky; I reviewed it (Mr. Fresh Releases Debut EP, Halcyon Sky), and then was blessed to interview the artist himself (Artist Conversation with Mr. Fresh – Halcyon Sky 8.8.14). 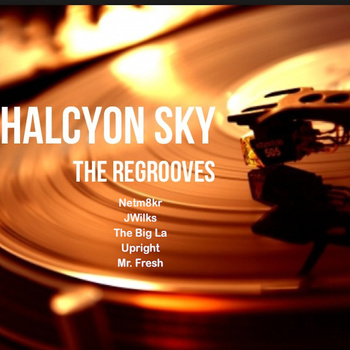 March 1, 2015 is the day that we were introduced to Mr. Fresh’s follow-up release, Halcyon Sky: The Regrooves EP. Mr. Fresh brings select Halcyon Sky tunes, masterfully remixed and featuring a cadre of talented musicians. The collaborations stay true to the essence of Halcyon Sky, while adding a flavor as unique as the musicians themselves. “I wanted to give them full creative license,” says Mr. Fresh. His decision to turn over his tunes to these artists resulted in a smooth, yet beat-laced EP that doesn’t disappoint. Just as “New Dawn’ set the tone for Halcyon Sky, “New Dawn (Netm8kr Remix)” lays down the rhythmic vision for Regrooves. “Deep (Big La’s Diagnostic Remix)” is the first of two “Deep” remixes. West Coast musician Big La, who also collaborated on the original track, gives the new mix an edgy groove, with hip-hop tendencies. “Dayz Like This This (Upright’s Edit)” comes alive with strong beats and a futuristic sound. “Deep (Mr. JWilks Bioremediation Remix)” brings us back to the original track’s soulful sound, adding a deep sensual undercurrent, and brings the original string arrrangements closer to the surface. Mr. Fresh rounds out the EP with “Halcyon Sky (Fresh’s Sky High Regroove).” Like his collaborators, Mr. Fresh has transformed the title track, replacing the nature sounds with rhythmic beats. This release is more than Regrooves – they are NEW grooves to add to your Mr. Fresh/Halcyon Sky collection. All Mr. Fresh’s releases can be downloaded from http://sftf.bandcamp.com.